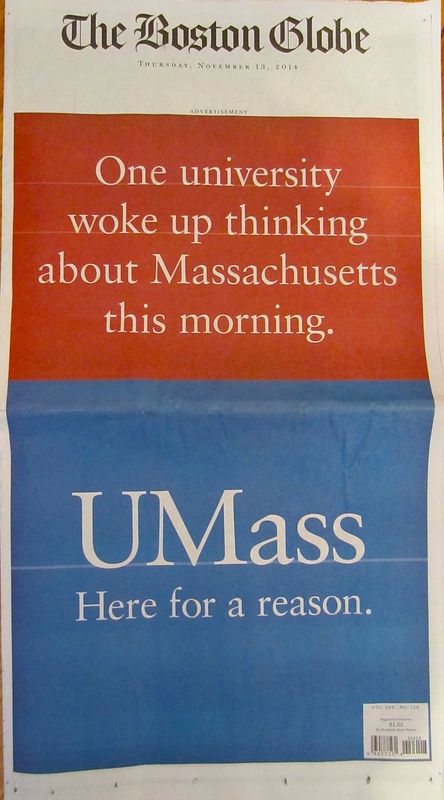 The Boston Globe is having quite a financial fling with the University of Massachusetts these days. 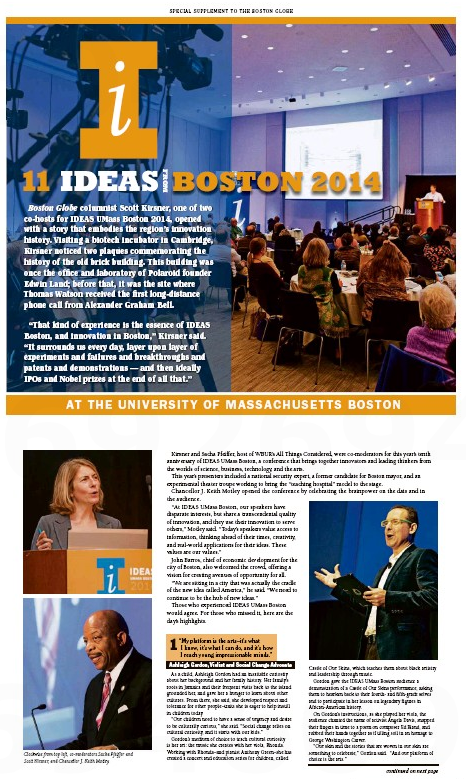 First it was this “Special Supplement to the Boston Globe” that ran this past Sunday. As the hardreading staff noted, that’s “Special” as in “Advertising,” which the Globe would have stated explicitly if it cared to be honest with its readers. 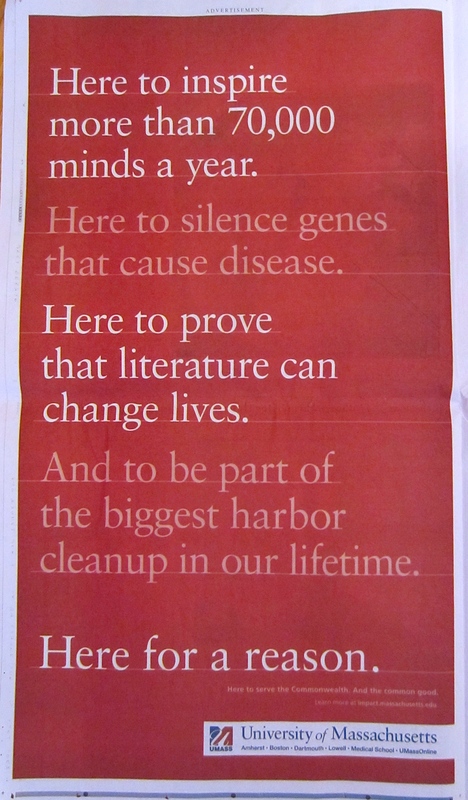 Now comes this doozie in today’s edition of the $tately local broadsheet (photos courtesy of the Missus). 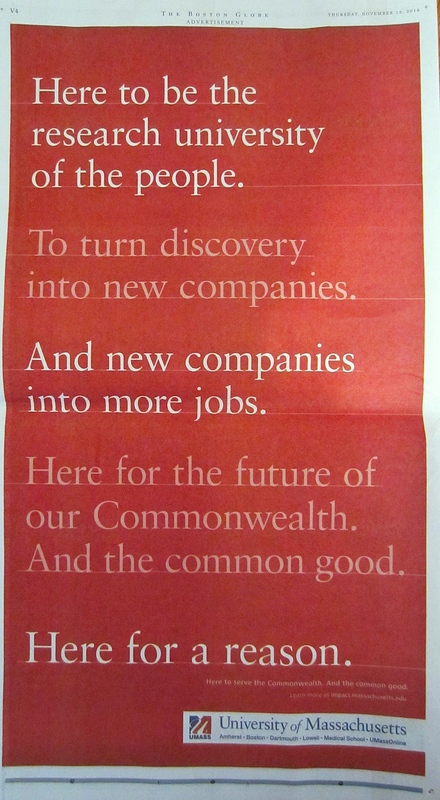 The Boston Globe apparently rejected a proposal by JetBlue Airways Corp. to run the same full front-page advertisement touting the airline’s arrival at Logan International Airport that the Boston Herald published last week amid voluble criticism. The Boston Herald ended up running the ad on Jan. 7, catching considerable flak for accepting an ad that one source valued at least at $25,000. 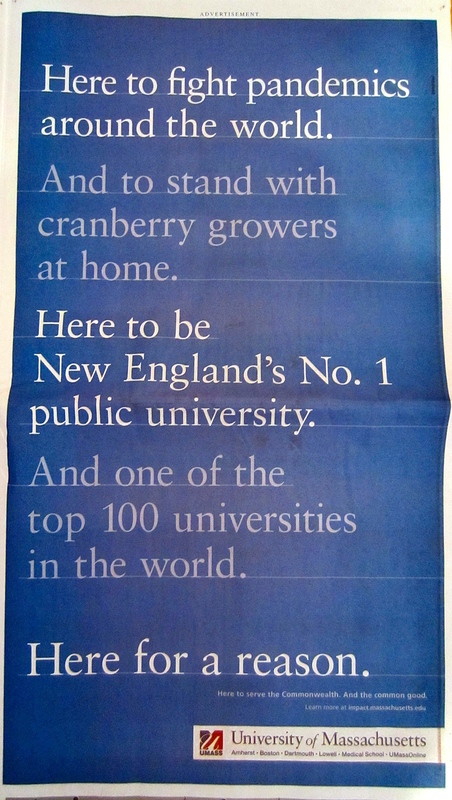 But a JetBlue official told the Boston Business Journal that the Globe also was approached with the same opportunity. And turned it down, sort of. Globe spokesman B. Maynard Scarborough said he believed the newspaper’s advertising department discussed selling a “wrap” to JetBlue, but no deal was reached. Such a wrap would not have contained mock editorial content, he said, adding the Globe does not sell Page 1 advertising and has no plans to do so. Well, that’s now “inoperative,” as they say. 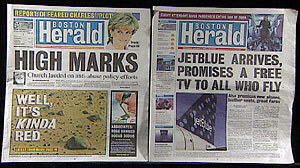 Here’s what the Herald did run (via WBUR’s Bob Oakes). That’s the actual front page on the left, the ad front page on the right. [A]t the very least, the front should have been prominently labeled as an ad. This isn’t just a violation of the traditional wall separating business and editorial – this is an out-and-out demolition. Fair enough. But to us, they did cross the line. This entry was posted on Thursday, November 13th, 2014 at 4:23 pm and is filed under Uncategorized. You can follow any responses to this entry through the RSS 2.0 feed. You can leave a response, or trackback from your own site. Of course, much has changed since 2004. These days, I’m OK with anything that brings in money as long as it (1) isn’t deceptive or (2) doesn’t put the news organization in a compromising position when it comes to future coverage.